Atlanta, GA – August 1, 2017 –Over 150 members from the Coalition of Advocates for Georgia’s Elderly (CO-AGE) gathered on July 13, 2017 in Macon, Georgia to hear 11 issues presented for consideration as priorities for the next legislative session. After casting hundreds of votes, CO-AGE members have picked their 2018 priority issues. The Georgia Council on Aging named Senator Butch Miller, R-Gainesville, as the 2017 Legislator of the Year before an excited crowd of over 150 people at the Coalition of Advocates for Georgia’s Elderly meeting! The meeting took place on Thursday, July 13, at the Methodist Children’s Home in Macon, Georgia. Atlanta, GA – March 30, 2017 – “We are excited to report to the 1.3 million Georgia seniors that your advocates, your governor, and your legislative supporters worked hard at the capitol this year to help improve your lives,” declared Georgia Council on Aging Chair Vicki Johnson. Georgia’s senior population gained more than $13 million in new funds for increased services and protections for Older Georgians. These wins come after tireless work by advocates. The Governor added $4.2 million to reduce waiting lists for in-home care, $750,000 in funding for senior meal programs and $250,000 for a rate increase for meals providers. The Governor also added $766,000 for additional Adult Protective Service workers who investigate the abuse of the elderly and disabled. The last hours of the session on March 30 saw the passage of House Bill 154, a bill to improve access to dental care sponsored by Rep Sharon Cooper (R-Marietta). Last year this bill received plenty of attention after the Georgia Dental Association disagreed with the Georgia Dental Hygienists Association about the bill. This year Cooper and Rep Matt Hatchett (R-Dublin) brokered a compromise that both groups could support. House Bill 154 will allow dentists to send their hygienists to clean teeth in nursing homes and other safety-net settings without the dentist being on site. This will improve access to oral health care for residents. The Family Care Act, another key bill for Georgia’s seniors, passed after six years of work on the issue. SB 201, sponsored by Sen Butch Miller (R-Gainesville), will allow employees with accrued sick leave to use up to five days to care for a parent, grandparent, or grandchild. The Family Care Act will help caregivers maintain their employment while still caring for their loved ones who are ill. The legislature also passed HB 221 sponsored by Rep Chuck Efstration (R-Dacula) which spells out the boundaries, expectations and duties for those granted a power of attorney. It would also define when breakdowns in that agreement constitute a crime. This legislation was prompted by cases of abuse in Georgia. Last year aging advocates added abuse, neglect, and exploitation to the Certified Nurses Aide registry to help combat elder abuse. This year advocates proposed a more comprehensive abuser registry. This registry would list caregivers who have committed elder abuse and include those who do not show up on official background check. Aging advocates are working with their partners from the state and private industry to create a solution for next session. Transportation is ranked by seniors as one of their biggest challenges. Aging advocates asked for funding to test innovative programs that help seniors solve the transportation problem. Funding would have allowed communities to tailor programs to meet their specific needs. In some areas of the state model programs partner with companies like Uber and Lyft. In more rural communities have offered vouchers to family members or friends who were able to offer transportation to seniors. Aging advocates were unable to secure additional transportation funding this year but will continue to find ways to address the need. Atlanta, GA (March 22, 2017) – Added funding for several programs critical to many of Georgia’s 1.3 million seniors is included in HB44, a state budget bill for FY2018, which passed final ratification in both chambers today. Foremost of importance is $4.2 million for Home and Community Based Services (HCBS), which will assist at-risk older adults to remain in their homes to age in place. Seniors from across Georgia consider this program as a top priority for CO-AGE (Coalition of Advocates for Georgia’s Elderly). The HCBS funding covers home-delivered and congregate meals, adult day care, respite care, personal care assistance, home modifications and more. At this point, over 9,000 Georgia seniors are on waiting lists for in-home services that would allow them to stay home with support, saving significant taxpayer dollars that might otherwise be spent on nursing home care alternatives. Sixty-six year old Michael in Augusta, Georgia is a great example of how the HCBS funding benefits seniors locally. Michael has Parkinson’s Disease, and the new grab bars in the shower – funded through HCBS to the local Operation Independence – help make his life safer and more comfortable. He first noticed a problem when he started having trouble with his legs; he felt weak and unbalanced as a result, a very new feeling for him. He regrets having to give up his favorite pastime of fishing and other activities, but he’s grateful for the home modification help he received that keeps him from worrying about falling and getting hurt. The budget bill also includes additional new funding for meals for seniors, much-needed staffing additions in Adult Protective Services, and funding for special projects to assist victims of Alzheimer’s Disease and Related Dementias. Atlanta, GA (February 10, 2017) – In a rare occurrence, two separate bills on the same issue, both critical to the health of Georgia’s older adults, were passed this morning in the House and the Senate. SB 12 and HB 154 passed with respective majorities of 48 to 1 and 163 to 1, after years of controversy. Both bills legislate the ability of dental hygienists to work in private practice and safety net settings under the supervision of practicing, licensed dentists. The bills address the dramatic disparities in dental care for residents of long-term care facilities, and for homebound and non-institutionalized adults. Seniors from across Georgia voted this program in 2016 as a top priority for CO-AGE (the Coalition of Advocates for Georgia’s Elderly). HB 154 authorizes a dentist, without being on site, to supervise up to four licensed dental hygienists in nursing homes, volunteer community health settings, etc. It was sponsored by Sharon Cooper 43rd. Sen. Renee Unterman 45th sponsored SB 12 that mirrors HB 154. The bill also provides for evaluation of the impact of this change. Atlanta, GA (January 11, 2017) – Governor Deal’s 2017 state budget proposal announced today includes $4.2 million in new funding for a program critical to Georgia’s 1.3 million seniors. The program – Home and Community Based Services (HCBS) – reflects the budget recommendation made in the Fall of 2016 by Georgia’s Department of Human Services. 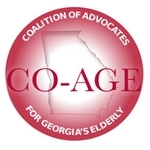 Seniors from across Georgia voted this program as a top priority for CO-AGE (the Coalition of Advocates for Georgia’s Elderly). In addition, the Governor earmarked $750,000 in additional funding for meals to fight senior hunger. The HCBS funding covers home modifications and a myriad of other services, including home-delivered meals, adult day care, respite care, and more. At this point, over 9,000 Georgia seniors are on waiting lists for in-home services that would allow them to stay home with support and save significant taxpayer dollars. Sixty-six year old Michael in Augusta, Georgia is a great example of how the HCBS funding benefits seniors locally. Michael has Parkinson’s Disease, and the new grab bars in the shower – funded through HCBS to the local Operation Independence – help make his life safer and more comfortable. He first noticed a problem when he started having trouble with his legs; he felt weak and unbalanced as a result, a very new feeling for him. He regrets having to give up his favorite pastime of fishing and other activities, but he’s grateful for the home modification help he received that keeps him from worrying about falling and getting hurt. August 25, 2016: 9:00AM - 4:30 PM. This great one day conference will change how you provide services! CEUs are available for LNHA and Social Workers. Read more about it and register at this link. The CO-AGE membership has voted! Our 2017 Legislative Priorities have been chosen from an impressive slate of potential issues! Read summaries and watch their promotional videos on our dedicated 2017 Issues Page. Thank you to all our committed advocates who attended the July meeting or cast their vote via our online ballot method! DHS Will Host A Senior Hunger Summit this fall!